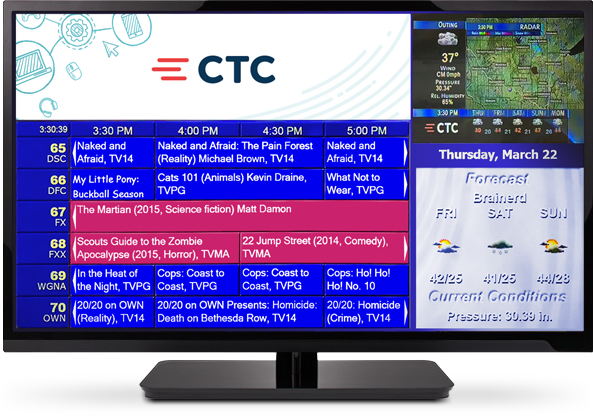 CTC has or will be performing an upgrade to your CTC TV service. This upgrade will not affect any TV with a CTC Set Top Box (receiver) connected to it. This will only affect TV’s which are directly hooked up to our RF signal with a coax cable connecting your TV to your cable jack on the wall. What are the Benefits of this HDRF Conversion? HDRF will offer a much better picture quality on HD TV’s. A simplified channel lineup — the duplicate local channels have been removed. Redesigned channel guide on channel 23. CTC’s RF equipment will be up-to-date and provides a more reliable TV signal. Provides HD quality content without the need for a digital cable box. Why are we converting to HDRF? CTC is converting to HDRF to provide our customers with HD quality service and to keep CTC’s TV equipment current and up to date. This new equipment will provide greater reliability and less signal downtime. It allowed us to redesign the guide channel on 23 and make it more functional. CTC still offering High-definition RF is beneficial because this requires no digital cable box, so it is a great option for easy-to-use TV service. What if I have an old “Tube Style TV” or a “TV made before 2001”? If you have an old style TV then you have a couple of options. You can purchase a new HD TV with a built-in digital tuner. It’s a great time to buy a new TV if you have been thinking about it. Purchasing a new HD TV with a built-in digital tuner will allow you to take full advantage of the HDRF system from CTC. It will give you high-definition picture quality that will look great on your new TV. The second option is to purchase a digital tuner box online or at your nearest local electronics retailer. Please keep in mind, if you are using a converter box, you will not be able to take advantage of the HD picture quality on most older TV’s and you will be adding the complexity of a cable box and extra remote. How do I scan for the HDRF channels on my TV? You can scan channels on all TV’s with a tuner. Each TV’s will vary slightly by brand and year, but most are similar. To scan for the channels, please use your TV remote to access the TV menu. Look for an option called “Auto Program” or “Channel Scan”. Once you have selected that option, most TV’s will ask you if you want “cable” or “antenna” — you will want to select “cable.” If your TV asks you to select “analog” or “digital”, please select “digital.” After the scan completes, your TV should have found and mapped all of the digital TV channels. If your TV did not find any channels, it’s possible that it does not have a digital tuner built into it. If this is the case, you will need to purchase a new TV or obtain a digital converter box by purchasing one online or from your local electronics retailer. If you have any questions on the HDRF conversion, please contact CTC at (218) 454-1234 and we would be happy to offer assistance.